When you play a song on Spotify Mobile, the song and artwork are displayed and fill up the screen. You can continue to use Spotify to browse or organize tracks by hiding what’s playing without stopping the music. And you can bring up information about the currently playing track again from almost wherever you are in the app. On the iPhone: Tap Hide to minimize the track information and continue browsing Spotify Mobile. Tap the Now Playing button at the top-right to bring up this screen again. On the iPhone, you can’t display information about what’s playing when you’re in your settings. You need to go back to another section, such as Playlists, to view this information. On Android: Tap the Now Playing tab (represented by an arrow) to minimize the track that’s playing. This tab now appears at the bottom of your screen. 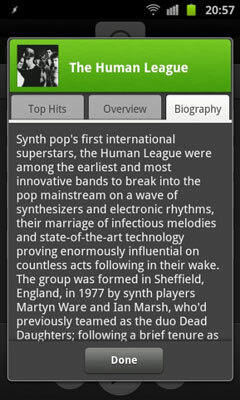 Wherever you are in the app, just tap or drag the tab up to bring up the track information again. Tracks still play on either kind of device, even when you exit the app by pressing the Home button. Press the I button to display a pop-up window for the track currently playing, and then select the artist name. Alternatively, you can press and hold a track name, and then select View Artist from the menu that appears; or do a search and select the Artist tab. In the Artist page pop-up screen that appears, select the Biography tab. The artist’s biography appears. Not all artists have content in the Biography tab: sometimes it’s just empty.